The Hilton Garden Inn in Allen receives guests from all over the world, but so far the closest they’ve come to having Swedes stay the night were two Norwegians who recently stopped by. The Swedish chef, Jan Loov, is hoping this will change, especially considering the Hilton Garden Inn just became a member of the Swedish American Chamber of Commerce. “It’s always fun to meet fellow Swedes and to know you’re not alone,” Loov says. “I definitely look forward to having more Scandinavians come stay.” Loov is the executive chef at the Hilton Garden Inn and is always open to customer’s requests. Should you be in the mood for some typical Swedish fare like meatballs or gravlax, he’s your man. Loov’s philosophy is to cook honestly. But there’s much more to Loov’s cooking than fish or even Swedish food. He’s been a chef for twenty years and has worked in Germany, New Zealand, Australia, and Boston – he’s cooked everything from emu to alligator to Texas-favorite tilapia. He says he really enjoys working in Texas because people are open and friendly and not scared to try new things, including different kinds of food. Cooking here is easier and more fun, he says, because he can be adventurous and try new ideas as much as he wants. Being a chef in a country the size of the US also means there are more ingredients readily available and more people who are willing to try them. “Here, the only thing that limits me is my imagination,” says Loov. His latest endeavor at the hotel involves trying to reduce its carbon-footprint by preparing food in a more environmentally friendly way. Going green may be a new trend in the United States, but Loov has always been environmentally conscious with his cooking, which not only helps the environment but makes the food taste better. Part of that effort includes buying vegetables that are locally grown to cut down on carbon emissions and cooking farm-raised fish from farms that don’t negatively affect the coastline. Loov has been cooking up some special green meals in preparation for Earth Day, but a visit to the Hilton Garden inn is sure to bring a tasty experience every time. The Hilton Garden Inn serves only breakfast in the restaurant but specializes in customizing special events, including catering and banquets, in the ballroom and meeting space. 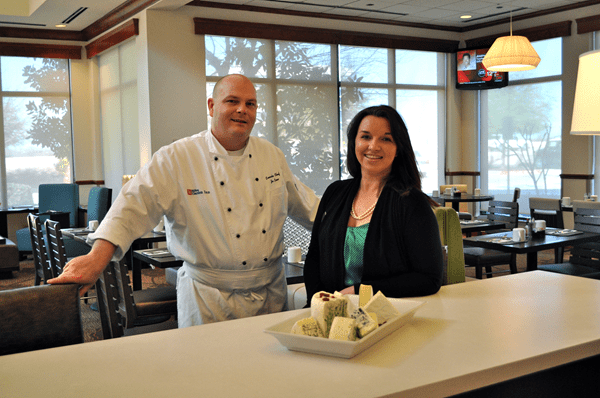 Whether you’re flying in from Sweden or driving from Austin, a visit to the Hilton Garden Inn Allen and a bite of executive chef Jan Loov’s food should enrich both your culinary and cultural experience.